A few short weeks ago, the world marked May 17th as the International Day Against Homophobia, Transphobia & Biphobia. Well, some of us did. As the horrific events of Sunday vividly illustrate, violence against LGBTQ2S people remains a serious issue in Canada, the US, and around the world. The roots of homophobia, transphobia, and biphobia run deep in many cultures (including the major world religions) and are a part of the colonial attitudes which western nations imported to the Americas and parts of Africa. As an openly transgender person living in Halifax - where discrimination against trans people was outlawed in 2012 - I sometimes forget how far we still have to come in eliminating ignorant and hateful beliefs about LGBTQ2S people. Each June, the LGBTQ2S community and our allies celebrate Pride Month in commemoration of the June 1969 riots at the Stonewall Inn which sparked the beginning of the LGBTQ2S civil rights movement. Even as we mourn those cut down in the Orlando terrorist attack, we must not give into fear. In the words of Harvey Fierstein, "never be bullied into silence. Never allow yourself to be made a victim. Accept no one's definition of your life; define yourself." Educate yourself, celebrate your life, show your pride! 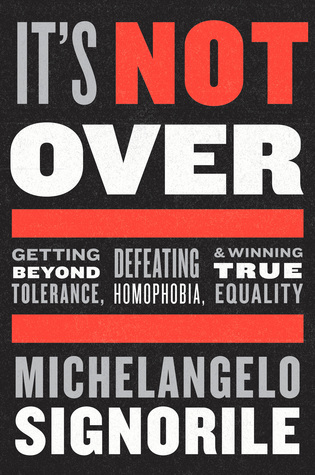 It's Not Over: Getting beyond tolerance, defeating homophobia, and winning true equality by Michelangelo Signorile. A Letter to My Congregation: An evangelical pastor's path to embracing people who are gay, lesbian and transgender in the company of Jesus by Ken Wilson. "You Can Tell Just by Looking": and 20 other myths about LGBT life and people by Micheal Bronski, Ann Pellegrini, and Michael Amico. Transphobia: Deal with it and be a gender transcender by j wallace skelton. Bi: Notes for a bisexual revolution by Shiri Eisner. Out Proud: Stories of pride, courage, and social justice, edited by Douglas Gosse.